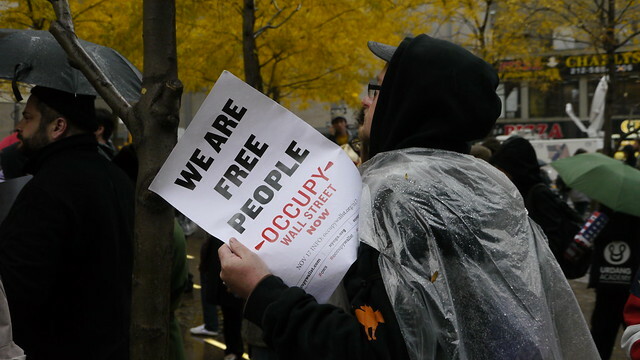 November 17th marked two months of We Are The 99 Percent and Occupy Wall Street. The original call had been for a 2-months occupation. Now a global day of action was planned for November 17th. But just nights before the NYPD had cleared Zuccotti Park (aka Liberty Square) in New York City - at the same time as many other occupations were "evicted". Thursday became a full day of protests, arrests, chants, signs, photos, videos, melees and injured protesters and police officers. I was not able to attend all the marches that went on from early in the morning until the big one at night. I'm just bringing you a few impressions from a mid-day visit to Zuccotti Park - right at the time when the police came into the park and at least one protester was hurt (the man with the bloody head featured in many papers today). Because the whole "take pictures and videos show the world via social media" is such a big element of this movement, I decided to post my video footage of the blood on the ground as well. But I do stand with the sentiment in the end: "we are all people" - including the police officers, who have a really tough job right now.